As they get older, many people develop a “spare tire” or roll of fat around the middle. 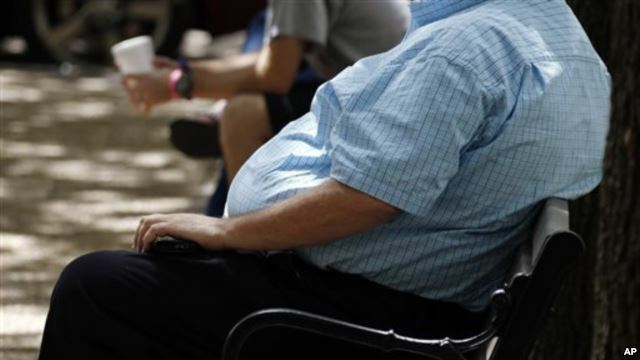 Now comes word that so-called central obesity could dramatically increase the risk of death. A new study found that normal weight or skinny people with so-called spare tires, where the circumference of their waist is greater than their hips, have a higher mortality rate, even higher than people who are obese. Men with potbellies were twice as likely to die prematurely – primarily of heart disease - compared to an overweight man. Among women with spare tires, the risk of death was 1.5 times higher. The study, published in the journal Annals of Internal Medicine, looked at health data collected on some 15,000 individuals. Francisco Lopez-Jimenez, a cardiologist at Mayo Clinic in Rochester, Minnesota, is senior author of the study. He says people who are a normal size all over except for their middles – a condition called central obesity – tend to be less active. “Because their weight is normal, they don’t have to do anything else and they may be less likely to exercise, to go out and be active and to eat a healthy diet," said Lopez-Jimenez. Lopez-Jimenez says fat around the waistline presses up against vital organs, making them work harder. Belly fat is also less metabolically active, meaning it doesn’t process sugar well, which can lead to diabetes. Lopez-Jimenez says the answer is not to gain weight to even out the body's fat distribution. Instead, he says the healthiest thing people with central obesity can do is eat a diet low in junk food and exercise, building muscles in their arms and legs. “Muscle is fed by sugar. So the more muscle mass the body has, the more sugar will be used," he said. It’s recommended that people of every weight do moderate to intense exercise at least three times a week.